So Kim had booked her flight for the 9th of December from the Los Cabos airport back to Brisbane, Australia to see some family. She plans to return to Karaka in Costa Rica at the end of January 2013. This changed our plans to sail to the overdeveloped tourist resort town of Cabo San Lucas instead of Mazatlan. For some reason it was a lot cheaper to check the boat out of Mexico in Cabo or Mazatlan than in La Paz. With everything going on I wished to spend more time in La Paz as it is such a great place and I have so many wonderful friends…but we had to get going or we wouldn’t have ever left. When I got back from my kayak trip Greg had left and Steve made it back as well as Tara another old crew who was back now for longterm after crewing a few years back with Karaka in the carribean. Tara’s a microbiologist from Northern California who specialized in the study of wild mushrooms. After a few days of intense provisioning we were set to go. Dylan decided to stay in La Paz and persue some potential work so we said our goodbyes to her, got the boat ready and were off for one final stop at the Marina Palmyra to fill up water and fuel tanks. Our friends Susanna and Frank came to say goodbye and Frank being a doctor, helped us organize some of the meds in our first aid kit and what we should buy in Cabo before heading offshore. 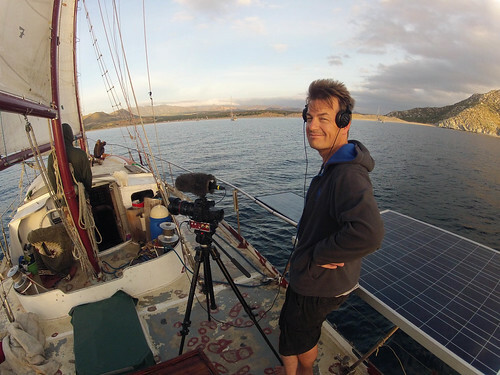 Simon wanted to get some shots with Kim while sailing for a few days on Karaka but it was tight. We had poor winds and ended up motoring, something in the engine overheated and we stopped in Cabo Frailes about half way. It was the morning of December 8th and Kims flight was the afternoon of the 9th. We decided it was best not to risk the chance of no wind the rest of the way to Cabo so Kim asked around the small fishing village and found a couple heading towards San Jose del Cabo and could give her a ride that day so she took it. Things were a bit rushed but it all worked out and we said bye to Kim and she was off. 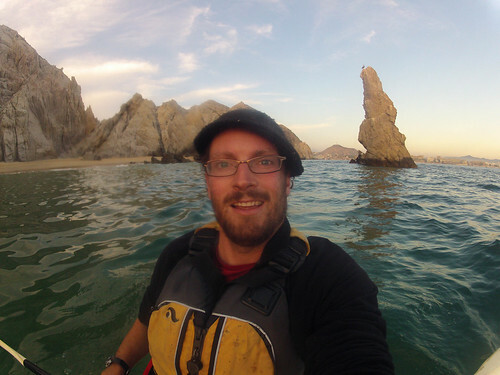 Simon, Tom and I went for a paddle around the big cliffs down towards Cabo Pulmo the next point north. 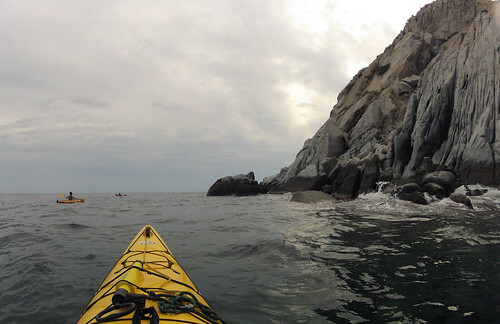 It was a great paddle and saw a bunch of sea lions on some rocks. We spent the night in Cabo Frailes and left the next morning for Cabo San Lucas. We had some light winds and saw lots of whales some humpbacks came really close to the boat and it was amazing. We made it into Cabo San Lucas fairly late around 1am. Cesar came and met us the next day on Monday the 10th of December, him and I went shopping, got some more fresh food and supplies. 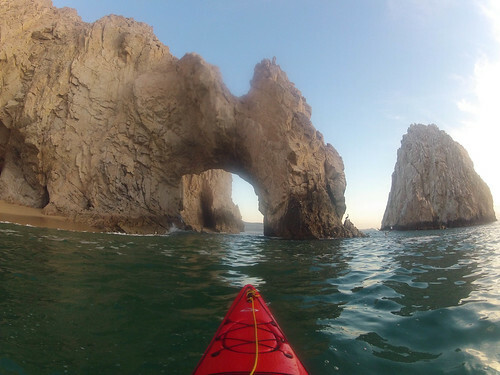 Tuesday morning I went for a paddle out to the arch off Cabo San Lucas and Tom went to the port captain and we were checked out. We got the boat all ready, went to shore for last minute ice creams and a few other last minute items and we were off around 2pm! 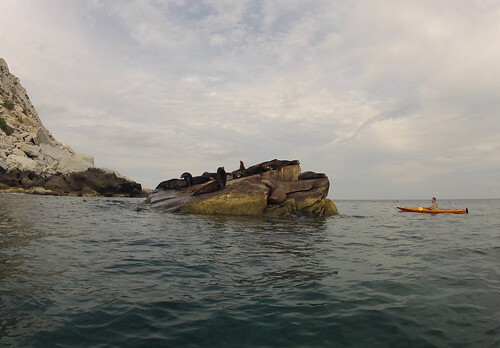 This entry was posted in Sailing, Sea Kayaking and tagged Cabo Frailes, Cabo San Lucas, la paz by zkruz. Bookmark the permalink.